Amazon Prime Channels is a platform available to Prime subscribers that aggregates third-party premium networks and other streaming entertainment channels. The platform offers consumers the “choice to watch premium TV channels without having to sign up to a bundle or a contract, giving them the freedom to pay for only what they want to watch” says Alex Green, Managing Director of Amazon Prime Channels for Europe. Amazon Prime Channels is said to have made $1.7 billion revenue from the à la carte service in 2018 and is predicted to generate $3.6 billion by 2020 (BMO Capital Markets). As a rough average Amazon share 70% of subscription fees with channels. 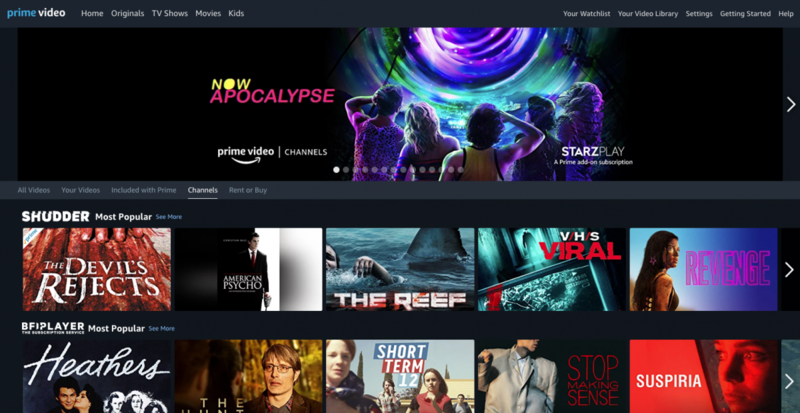 Amazon Prime Channels arguably offers channel distributors a platform with scale and reach, as well as removing friction from the OTT process by integrating with Prime Videos catalog and providing access to subscribers after a few clicks. Since its launch in Dec 2016 Amazon Channels has grown to have 158 channels in the US – although this seems to have slowed - and has launched in the UK, Germany and Japan. Prime Channels Japan launched in June 2018 (with only 20 channels growing to 40 in Q1 2018) with France and Mexico are said to be following soon. Whilst Amazon channels continues to grow into new markets, the channels on the service are not achieving globalisation, with only 10 channels crossing every market from the 252 available.